For some time now I have been look­ing around for a basic sun canopy I can use while away. I didn’t want some­thing that would be per­ma­nent­ly fit­ted to the van, like a Fiamma (besides, they’re very expen­sive), and I didn’t need a full awning as I do not need the space. I think I’ve now final­ly found exact­ly what I’m after, the Reimo Char­ly Sun Canopy, and it was only £59 via eBay, also avail­able direct via Camper­works web­site. Pre­vi­ous to buy­ing this I bought a Van­go Sun Canopy, but it had so many ropes and com­pli­cat­ed poles to set up, I gave up and sent it back. The Reimo canopy is sim­ple, it has two very stur­dy poles with just one guy rope on each and the height is eas­i­ly adjust­ed. It attach­es to the van via the Kador method, I have a hid­den J Rail in the gut­ter and using a fig­ure 8 rail it attach­es quite firm­ly. 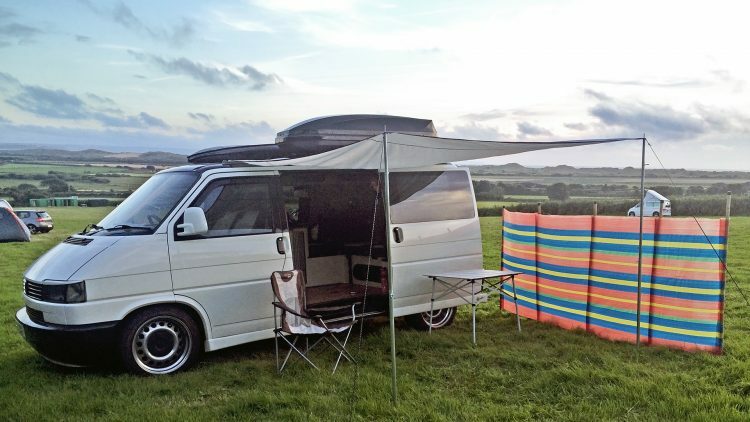 As with all awnings, I wouldn’t rec­om­mend leav­ing up on a windy night as it just tugs on the van, but while sat out­side it held well with quite a keen breeze. If any­body is look­ing for a sim­ple sun canopy then I would def­i­nite­ly rec­om­mend this set up.